I could have written this all along as I was writing and Mom was all through my other stories. She was Mom to so many around her world that I hope you will recognize and be able to refresh how wonderful she was again and again. Mom had such an honorable way of conducting her life and as beautiful as she was on the outside it was a reflection from the inside out. Mom loved material things, but she was not driven to have expensive houses at any cost. She was a teacher of good down to earth living and the creation of a comfortable home and the ability to use the talent you already possess. As I grew and watched mom it became a part of my life to work towards a calm, fun, productive comfortable home life. With being united with a man that was driven to do a good job at whatever job he possessed mom was a good match for him. 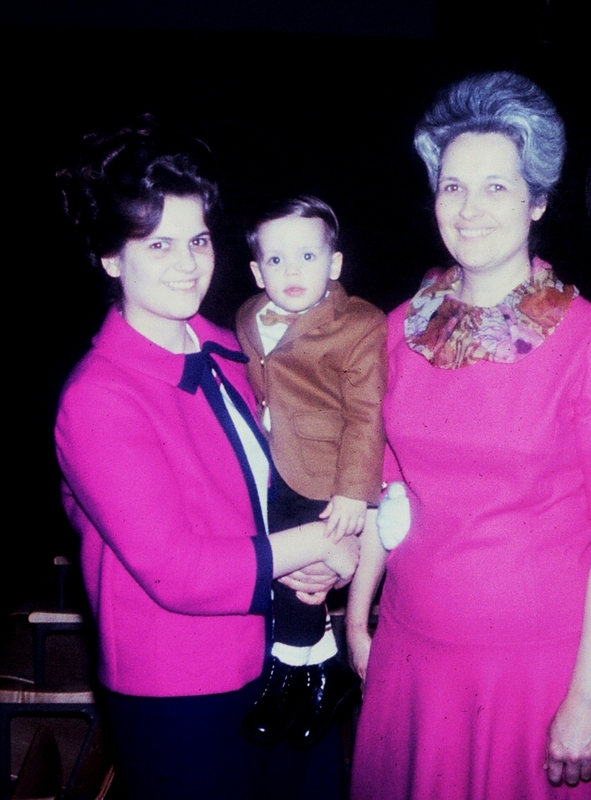 As far as her life as a Pastor’s wife I thought mom did it all except for preaching. 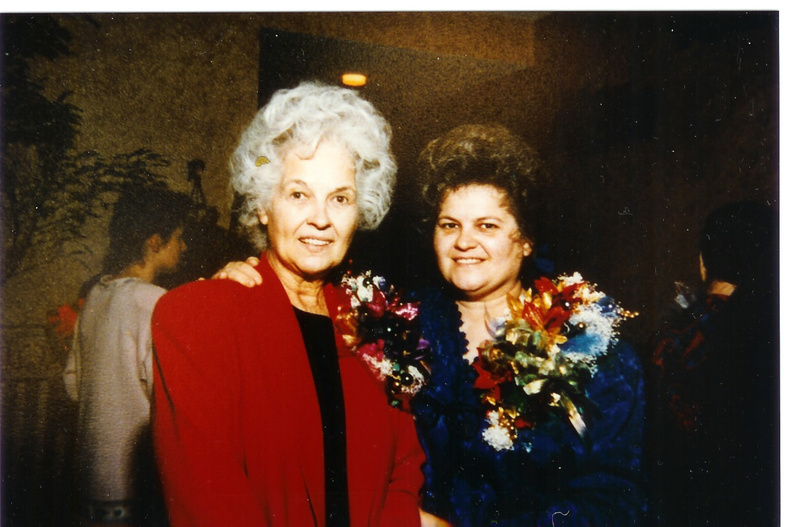 She did the music, entertaining, comforted people, made sure dad had everything he needed to do a good job, she created social times for the church, holiday plays, baby showers, arranged all the communion needs, counseled young people that needed help, counseled women that needed help on and on. I have seen her flustered at the volume of it all a few times but she was not a complainer and she did her jobs well and with dignity. We did not take regular vacations. 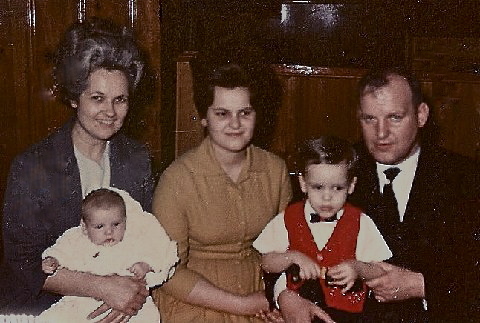 Dad was a Pastor, worked for the Secretary of State as a License administrator 8 hours a day five days a week, he was a District Superintendent of Michigan UPCI, he was one of the Six Elders of the UPCI for many years. He did more than his physical system could hold up under, but he did it till he died. Our vacations were Conferences, Camps, special meetings and what ever happened around the church. We had so much going on, I did not realize how deprived I was for not taking anytime off. We were far more active than we had time for usually, and besides that I grew up with the words of how privileged we were and what a good life we had. Dad did make a special effort to take us to Vermont and out east for a couple days for Mom. She loved the books by Louisa May Alcott. Dad took us to their home and area and we went through the home and back to our home in a short time it seemed. Spring break was a time of going to Lansing for a day or so to be with Grandma Starr and Aunts and Cousins. We always had a good time during the summer or spring break even though maybe we didn’t go on a long trip. Mom could create special times out of where we were and it would be so pleasant and easy to do, I felt happy. It is amazing the warm feelings I still have of my childhood and the simple things we did that meant so much. In fact, one time that really brings fun memories was when mom made a big gray haired lady out of stuffing. Well I need to ask her how she made her. We would sit her in a chair and she was nicely dressed and it was a lot of fun. She was probably five feet tall. We got our picture made with her and she adorned the couch. Mom was very artistic. She did oil painting portraits of Grandpa and Grandma Anderson, Grandpa and Grandma Starr, Rebecca as a baby, herself and all five of us girl’s faces as babies. She was excellent. 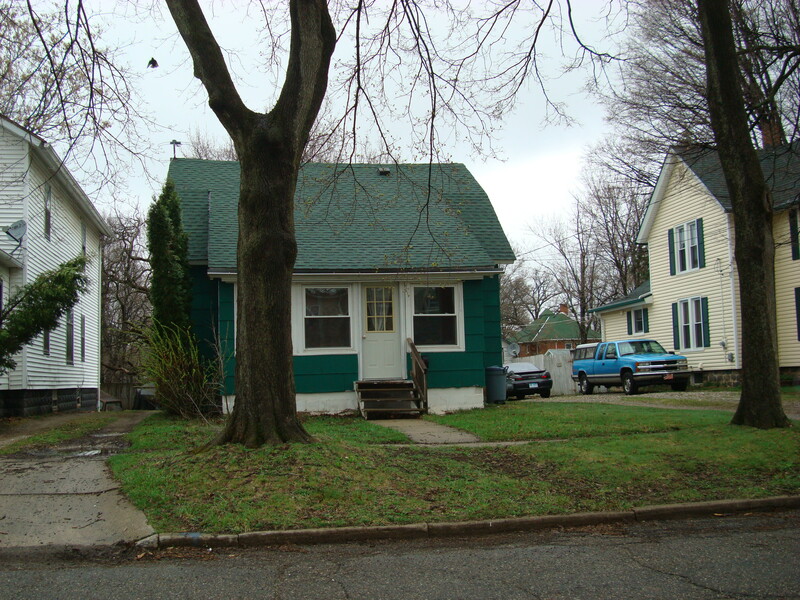 Our small home on Crandall Street close to the church. In my teen years we lived in a small house less than a half block from the church. We easily walked to church. Mom would build bookshelves for the many books we had. We were raised with a love for books. I also remember dusting thousands of books, it seemed. Books were comforting for me shelved there in our living room and nearby were a pretty wood fireplace with a pretty mantel and an electric log glowing all for atmosphere. Mom created and built it. No matter what she wanted she had a way of making it, if it wasn’t easily gotten any other way. I had a boyfriend Gilbert Davenport that would come to visit from Flint, Michigan. He was artistic and would draw caricatures and give them to me. He was going to College in Grand Rapids to be an Architect. Mom decided she wanted to paint a mural on the dining room wall. She began painting and when Gilbert came he was involved with the painting as well. It became a part of the fun for a while. I would pass the mural and think how beautiful our house was. When I look back I know we had about the smallest house on the street and I feel blessed that mom just worked with whatever we had and made it seem special to me. 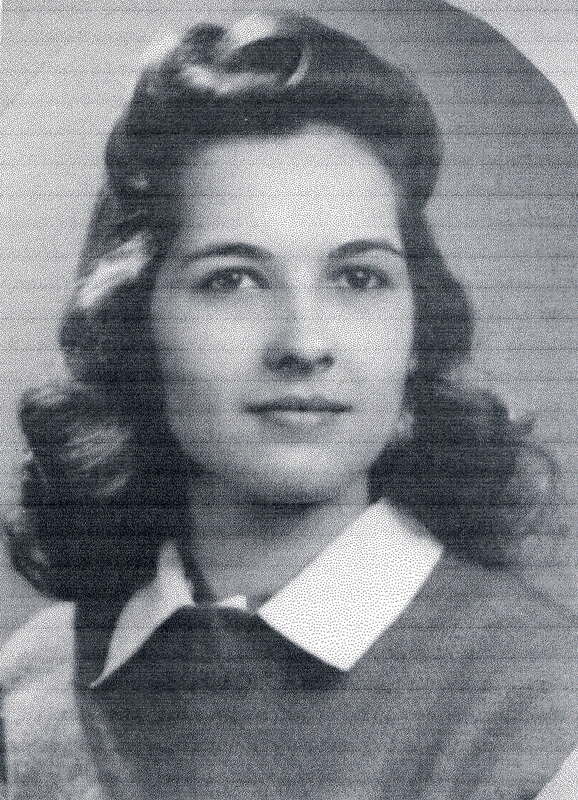 Mom’s talents were many; her greatest talent was her affect on lives of young men and women that needed guidance. Growing up it just seemed like people were drawn to mom for guidance in their hectic troubled lives, and she could help them recreate a better life and go on. I thought we were rich, and I know in many ways we were, but we didn’t just get rich in monetary things. We lived like those we lived around. Many times young men that I thought were interested in me enjoyed the most sitting and talking to mom. Even Marty, my husband said he feel in love with my mom first because I already had a boyfriend. She was so easy to talk to and so beautiful and honorable and very down to earth and they always loved talking over their ideas of life and whom they liked, and what her opinion was. At camp time it was a busy time for mom. She was always making sure guest were settled in comfortable, music was settled, dad was taken care of and ready to get through what he had to do. She would be running for odd jobs like making sure everything was in working order. If the restrooms were broken down or kitchen sinks were stopped up it was mom either getting it fixed or just plain doing it her self with a plunger in her hand. It was a trial to her many times that dad was not the handy man. He did many jobs that required mental anguish, but he was not a handy man in any stretch of the imagination and she did not even try to push him to be. Mom could easier do it herself and get a better effect in the end and so she tackled it. 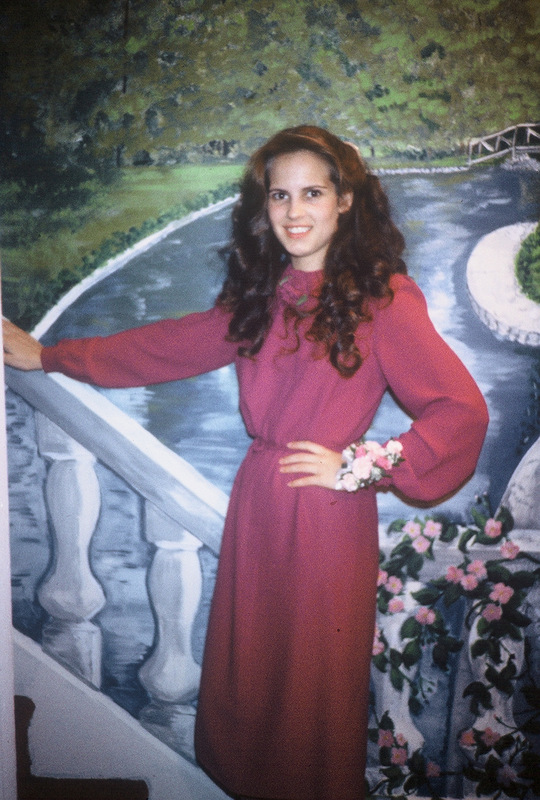 Many times we would be sitting eating dinner or just together and dad would say girls you have a beautiful mother. He adored mom. He was a bit complicated to take care of and live with because he was always full of jobs. Mom was so important to him and she worked hard to pave the way for him to accomplish whatever came his way and whatever he felt he needed to do. Dad pretty much left the whole job of raising all five of us girls to mom. I am glad he did. He was the main financial provider and he would protect us and he loved us fiercely but other than that mom did it all. We had a full, busy, and fun life surrounded by church and it was the center, plus school and home. Easter was a fun time at our house. It was a time mom would work on what we were going to wear and she would many times sew our dresses and find a hat to match and get new dress shoes. She would make those times so much fun by coloring eggs with us and drawing pictures on the eggs and decorating them and making baskets together. She would hide the baskets for us to find. Funny now how important to my mind all that was and still is. I knew the real meaning of Easter that Jesus died on the cross for our sins and rose again the third day, but was still allowed to be a child and enjoy chocolate Easter bunnies and get a real baby chick or a real baby duck and bring it home and enjoy taking care of it. Some of our favorite outings with mom were trips to the Goodwill. I thought everyone loved the Goodwill until I got older and realized some act like they were embarrassed and disliked the thought of shopping there. Rummage Sales and Goodwill shopping was not really necessary, but fun. Aunt Theodora and Mom taught us to enjoy those places. They found beautiful clothes and furniture and could make what they found an envy of others that were shopping at the Ritz. We still go to Marshall to the Goodwill when we are together at the campground. We have even had the fun of spotting things we gave the Goodwill to get rid of it. Mom and Aunt Theodora always looked dressed to the hilt and they taught us we didn’t need to say where we got the beautiful stuff when we got a compliment. I grew up with Mom taking time to play the piano on special holidays in the middle of our time she might play one of dad’s favorites “The Tennessee Waltz” or Uncle Jimmie might ask to sing “Pearly White City.” Mom was always the best piano/organ player. Her playing is full chords and it is understandable melodies that I can’t get away from in my mind when I think of good music. She has blessed many a Camp meeting and Conference and our home and holidays were blessed with regular request for her to play. She tells of when she was around eight years old she was already playing for Church. Grandpa Anderson would get to the end of his sermon and the family would wake her up to play for Altar Call. When we girls started taking piano lessons mom decided to take lessons to learn what she was already doing by ear. She has perfect pitch. She can tell you what key they are singing or playing in by ear. When dad would start a song she could find him when no one else could. He usually would sing in 5 or 6 sharps. That would baffle other musicians and they would look at mom with a longing for her to be the one playing for him. She still plays and I have always been amazed how even though she doesn’t know your song she seems to be able to follow and doesn’t mess you up. She just knows where to go. Mom was very proud that her daddy was Greek. He came from Greece around 13 years old and he had naturalization papers that as a child mom wanted to take to school and show. Grandpa never let her because he was afraid she would lose them. He was very nurturing and worked along with Grandma Ada raising their eight children. Mom would tell us about a song or two that she learned from Grandpa in Greek. She learned customs and a way of life that she has passed on to the rest of us girls. She taught us to have deep respect for our father and serve him first at dinner, and she would always in her example of doing, show us how to be adored and taken care of, by the way we revered our husbands. It was something that was a pleasure not a dread. Dad worked a regular job besides pastoring and several other hats he wore. When he came in from work mom never told on us kids how bad we were or complained it was a pleasant time for him when he came home. She might have a bit of bad news to give him but she made a point not to ruin his first moments of coming home. Mom spared us dad’s reactions. His mind was given a chance to unwind a bit and if we needed handling she just handled us. With five girls we might have had some real drama now and then, but I hardly remember any. Life was pretty calm on the inside of our house. I realize now that many things happened and could have invaded our home if mom would have allowed it to consume her in front of us. I did begin to feel the tough times, as I got older and am so glad I learned to handle it with hope and faith in God that when I woke up in the morning things would be better. We were taught to take things gracefully, no huge loud reactions that would help nothing; we were comforted and taught to have poise through it all. Mom was so easy to talk to. She didn’t pressure us to be competitive she just seemed to find our good areas and provide opportunity for us to grow at our own pace. When I took my first baby Anthony, to our church nursery in South Bend I would feel so uncomfortable. The young mothers seemed to compete on whose baby was taken off the bottle the quickest, or whose baby stood and walked the soonest on and on. Potty training was a spanking session for some and I was feeling like I was not a very smart mom and my baby needed to rev up. I finally broke the news to mom that I wasn’t doing well according to some of the other mothers. She said, “What is the hurry to push the baby in every phase,” They are not doing a better job and just smile when you hear all that and don’t respond. Just keep doing what your doing and at your babies pace. In other words just smile and keep doing what you’re doing anyway. I have been blessed and relieved many times by that statement putting my mind at ease. She also always would say I could learn along the way what works best for my child and never to feel like I know it all. Sometimes I see new mom’s that on the other hand think no one can help them or they don’t want any advice from their mom and older women and they need it badly. I have seen many glean good advice from mom and I was blessed to learn some first hand. Dad died at 62 years of age. It was the biggest shock to not only our family personally, but to the church family in Albion, and so many others that knew him across the country. I watched how mom handled this again. She was in so much grief, but again she was still aware of where she was needed, how things should be handled, she was serene, and she was so honorable. I saw her carry a briefcase and take care of church business by words of wisdom even before the Funeral. We were a blessed family of ministry to have good men of God and saints that were present to give support and strength through it all. It was a beautiful funeral and harmony with our family to combine in honoring our father. The night dad died I felt like I was in shock. It was unexpected by us all, but because of a mom who could manage being shattered but not unable to still trust God to get us through. We came through it all still in one piece. At one point before the funeral we had to be conscious of the needs of safety for the Albion Church. These were our beloved people of God that were in need of security too. Mom had us all sit around the dining table and she mentioned that we have to face a choice of a man of God for the church. We were all in ministry and we all could have wanted to be the ones to get the church. Mom went around the table to each couple and said she felt like David and Rebecca Trammell would be right. She looked at each of us individually and each couple agreed we felt like she did. She said there would be a business meeting not too far in the future for the saints to have a choice to vote. If it went in Honor of David and Rebecca, we as a family were expected to Honor them and never interfere or cause division. We had our chance to speak and all that was needed now was support and harmony of the family from then on. It has been as smooth a journey as we could ask for, and we can thank God for the way our mom handled her life and in so doing helped us to this day still be undivided and united in sweet times of fellowship. I did mention mom loved the books by Louisa May Alcott and Grace Livingston Hill. 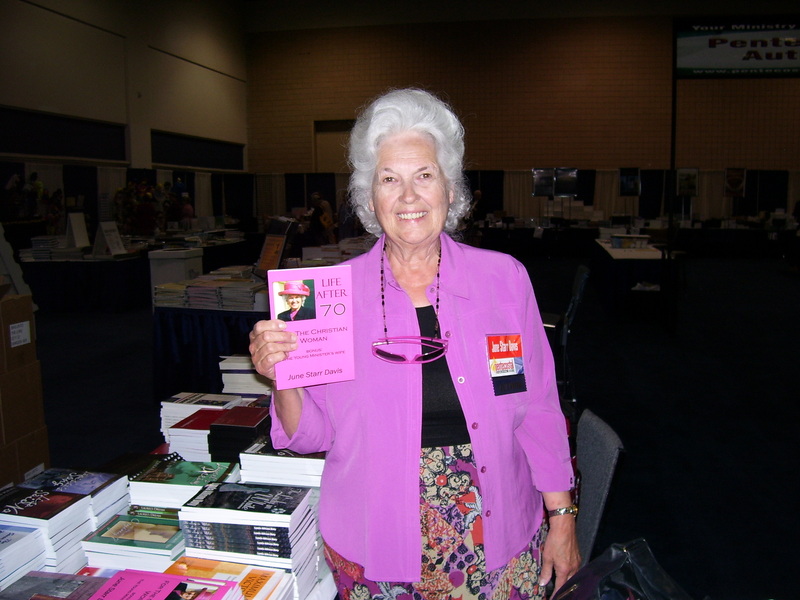 In fact, my name came from the book, “Marcia Schuyler”. Mom would tell us little things about the girls in Louisa May Alcott. I had to read those books cause they sound so good and they were. “Little Women” kind of set mom up for the five girls she got. Mom made mud pies with us, she found a place called, “The Old Swimming Hole,” and we went there with a lunch and the water was like a brook with nice clear waist high water and we splashed and played and had lunch. I even remember getting black suckers between my toes. It all was refreshing, clean, fun memories. The simple things like taking someone home from Sunday school for the afternoon and going to Victory Park to play, or walking down to the parade at the end of the block, I see mom in all those memories. She taught us to cherish the lovely simple pleasures of life like playing checkers and taking a ride to the countryside and stopping to pick asparagus or walking to the dairy barn to get Peanut Butter Cups. Mom is in all of those sweet simple memories. She has made special times so special without extravagance and it has all been so important for the life I have lived. 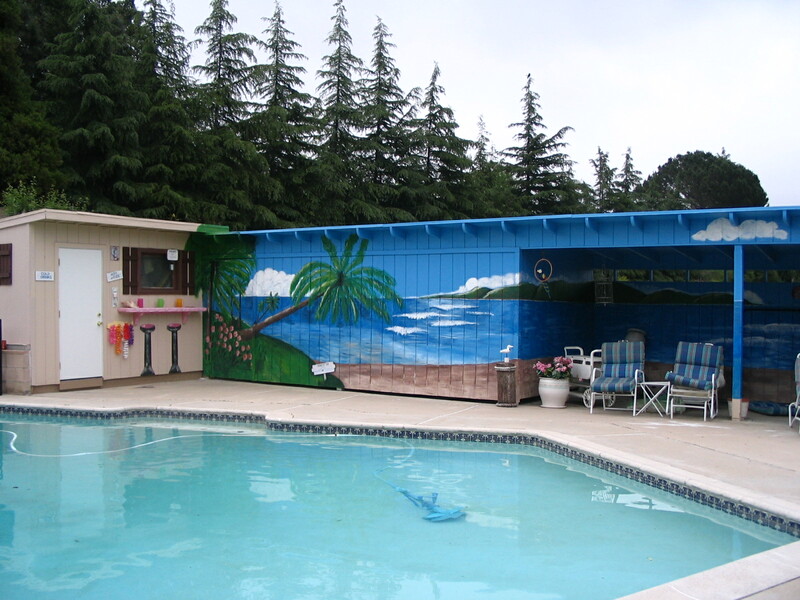 A mural mom painted about three years ago in CA. 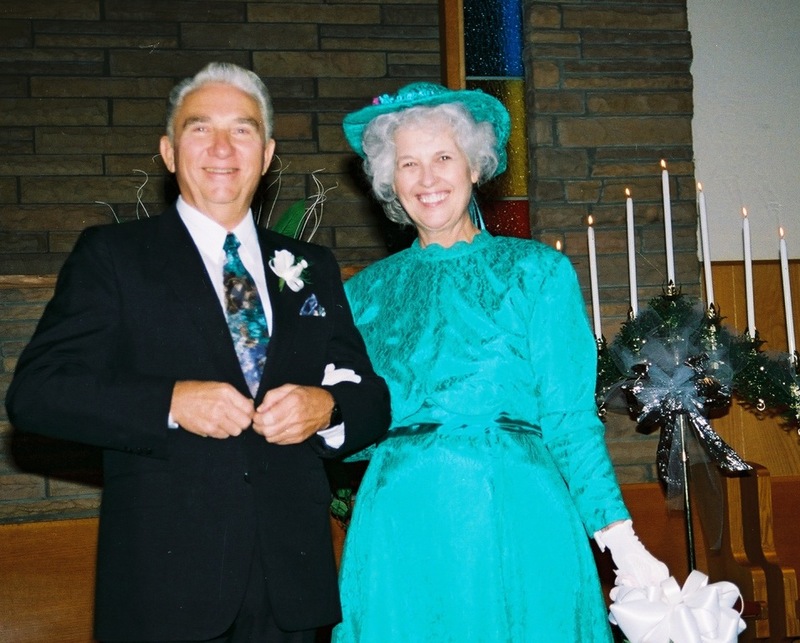 It was about six years after dad’s death that a wonderful man of God came into our lives. Mom had met Howard Davis and his wife Janine, when she went to California to be with my baby sister Sara and Tom Copple during a meeting they were holding at Gateway Christian Fellowship in San Bernardino, CA. A year or so after mom went there, Sis Davis suddenly passed away and mom heard it. She felt it so bad knowing how she felt when dad left so unexpectedly. Mom can tell that story. Even though she was in Michigan and he was in California, they got together. That has been 18 years ago. She again made a wonderful choice for herself and our family has been blessed again with Bro. Howard Davis as a part of our family. Dad would be happy to see her so loved and she loves Bro. Davis so much. They are a beautiful couple. We can laugh, visit and enjoy our time at their home in California. Mom loves not just him, but his daughter, Glenna, her husband Royce and their children Jessica and Logan. Mom and Howard Davis just married. When we get together, it is sweet fellowship and fun. Mom is still doing creative beautiful things to their home and she still loves coffee times on the porch in the morning. 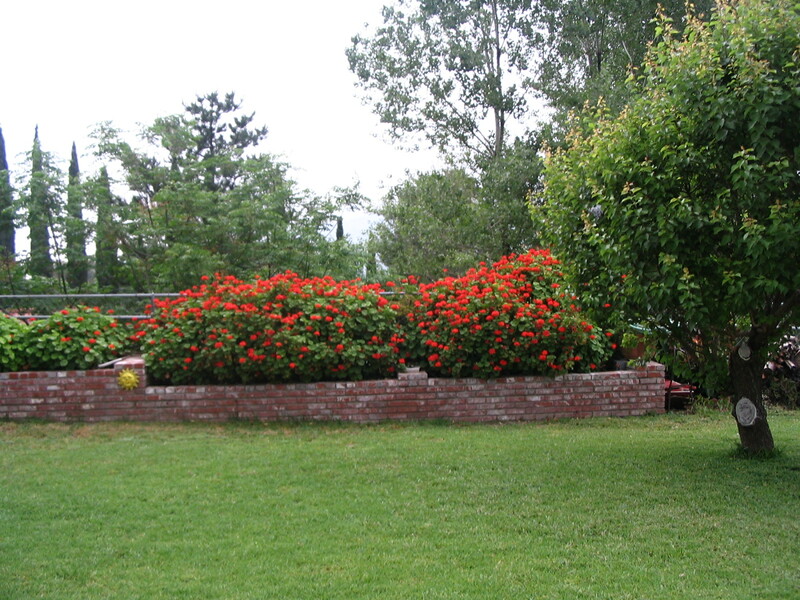 She still decorates her home in beautiful colors, and she painted a bright mural on the shed around the pool area and planted Geraniums all around the house and yard. Bro. Davis is quite a handyman too, which made it even more fun. She wanted birdhouses so he had the tools and built her several birdhouses and helped her with the flowers and brick planters and the garden in the yard. She loves Robins, which are Michigan’s State bird. She feels blessed to have about 30 robins show up. They have come back to Michigan camp and enjoyed traveling when they want to. Mom still plays the organ when she wants to. We all Love Howard Davis and he is the grand and great grandpa to our children and grandchildren. When we go there he is so at ease to be with we enjoy our time there at their house. Mom has been a wonderful leader of how to have a good family and be a good wife and still be sane. She has blessed so many by her example of being content and working with what you have and making it beautiful. Troubles have come and heartaches have come and she has lived her life so serene and made good practical sense in everyday living I feel blessed to say she is my mom. I have been laughed at and accused of not telling the truth, but I really have never been able to bring myself to sass mom yet. She is strong in her personality, yet so wise, she is not overbearing, yet when she says something I believe it and will probably do what she says whether I want to or not. I mentioned not being able to sass, well I don’t feel perfect and I have certainly thought I had a idea of my own, but somehow mom might frustrate me but she seems to be right and I feel how much she loves me. I owe her so much honor! WoW!! Loving this! She is a one of kind treasure for sure!! Thank you Marcia. I have felt rewarded for being a mother by that beautiful tribute.You were a easy child to raise and always helped with the younger kids. I loved it and felt so honored to have all those nice things said about me. I love you. This is what you call giving roses while they live. Marcia… I’m not sure they make women like your mother and mine anymore. Reading your story about your mom brought back many memories of childhood. I am blessed to have spent time in your mom’s home and to have been benefit of her beauty and wisdom. As preacher’s kids we learn early on to share our parents with the world. All the “kind of people” they worked so hard to make sure we weren’t. Love you, girl. You are surely a wonderful tribute to your mother and father. Marcia; That was just beautiful! As you know, your mother had an important role in my life. I ran to her many times when I was frustrated, and had no one to listen or understand me. Your mother always made me feel ‘sane’ again, and her advice was always perfect for me. You and your sisters were like extended sisters to me…didn’t we have fun! Love ya! I realize how important it was for me to write it down . Thank you for reading it. I am glad mom could read it. Amazing! Enjoyed your post about your beautiful mother! That has to be the best thing to receive a from a daughter, simply beautiful. May God bless you and Bro Ballestero. Thank you so much for sharing your mother with us- she is so very beautiful. 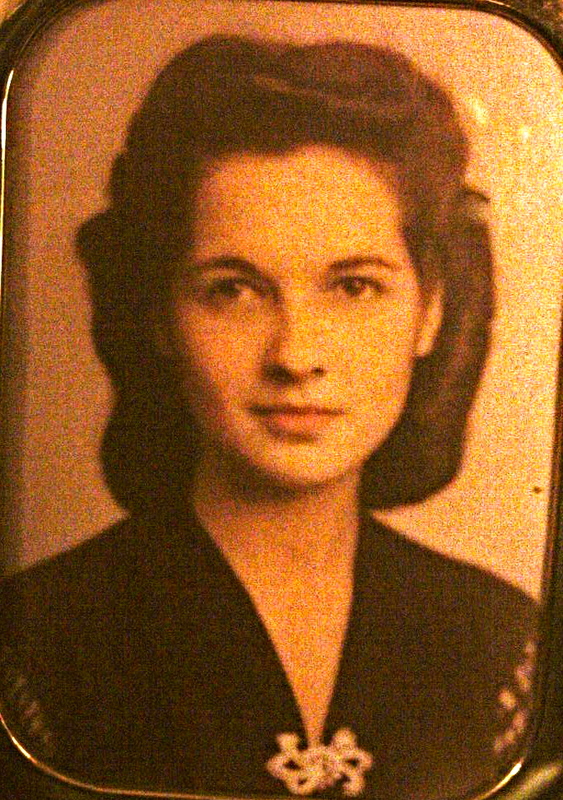 It makes me want to write about my mother who is a beautiful lady also. It seems that their generation had (and still have) so much class! That’s very rare indeed these days! Marcia, how totally beautiful this tribute was. I would give a lot to be able to write so expressively. I do know your mother enjoyed getting her flowers while she’s living. You have a beautiful mother & I just love her. She is always so gracious to me & makes me feel so comfortable when I’m around her. Thanks for sharing her with us thru this blog. Mom, This is written so expressively it’s easy to imagine yourself in each scene you describe. Reminded me of many great memories of being at Grandma’s house in Albion growing up and staying there over the summer. You should write a book about your life and experiences like this. Thank You Marty Joe, you kids are in my writing very much I hope you all got to feel a bit of what I felt growing up. Albion was a nice small calm town to grow up in. It was fun to even think of you kids getting to spend time there whenever you could through the summer or holidays. Wow! What a tribute to your precious mother! I can’t wait to get my copy of her book at the upcoming Michigan District camp meeting! I enjoyed so much reading this…what a wonderful example of motherhood.